Fashion circles are abuzz in anticipation of New York-based designer Katie Gallagher's dramatically sculptural garments and endearing yet contemplative motifs (think inflated cats, Neuromancer, Veronica's Veil) to be presented at her first full ready-to-wear collection on September 12. The dainty, dreamy RISD alum further refined her skills at apprenticeships with threeASFOUR and Anna Sui -– garnering industry whispers of her unrivaled technical prowess and diligent emphasis on the wearer's personality. It was a pleasure to chit-chat with the fellow history buff and rural Pennsylvania native on her pixie-like upbringing, distinctive design journey, and upcoming Spring/Summer 2010 presentation. I grew up in a farm town in Pennsylvania. I was surrounded by forests and I played with wild animals all the time; in fact, my mom thought I was a saint because I would perpetually approach and touch random animals and they never ran away from me! I was a forest creature, really –- I never wore shoes, and I hated wearing clothes (but always wore my cat on my head)! Growing up consisted of picking mushrooms and berries, making little potions... and avoiding clothes. I'm not really sure how I ended up being a fashion designer in New York, but here I am! 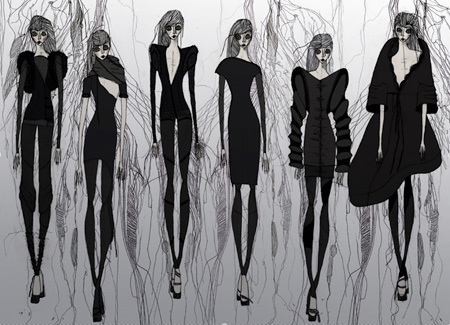 What first sparked your interest in becoming a fashion designer? When I was younger, I was always vintage shopping and altering my clothes on a little Singer machine. When I attended art school at RISD (Rhode Island School of Design) I originally had the intention of painting, drawing, and doing whatever I wanted! I was so interested in drawing and dividing up the human body into shapes –- by dramatizing and adding character to it –- that I majored in fashion to learn how to sew properly and make patterns to do this in a more effective, refined, and pure way. I haven't really stopped making clothes since... and now I'm launching my first collection! Who or what was your chief design inspiration last season? ...and for this upcoming season? Both in my last collection, Shroud, and in the upcoming collection Veil, I have followed a pretty similar focus: pattern-making, wrapping the body, and a ghostly, ethereal feel. Both titles Veil and Shroud come from historically significant artifacts -- namely The Veil of Veronica and The Shroud of Turin -- wherein a piece of cloth had taken on much more meaning than the sum of its parts. However compared to the all-white Shroud, Veil embodies a much harder approach; it's mostly composed of blacks and I was affected by very dramatic butoh dancers -– these really curated, focused body positions and movements. I tried to contrast that image with some of the aesthetics and moods of cyberpunk literature: novels like William Gibson's Neuromancer and Neal Stephenson's Snow Crash. This sort of high-tech, low-life world. They are very different places: threeASFOUR focuses primarily on pattern-making and construction (just like I do) so it was a great place for me to learn. Anna Sui had a very focused aesthetic and incorporates everything she loves into her clothes; they're very much true to herself... and I admire and respect that. How will you be presenting your new collection? I'm having a presentation of 22 looks and some 70+ separates at the Tribeca Grand during New York Fashion Week. I am trying to blow out the presentation as much as humanly possible given my limited resources; I have funded the entire collection out of my pocket (which is a very small pocket!) and I've handmade all of the samples, cut all of the patterns, and glued and hammered the leather all by myself. I've literally set up a small production house in my studio! It's amazing how many people have gotten behind it and helped me with actually presenting the collection... I even have a German industrial group making a custom soundtrack for the show. It's pretty ridiculous. I hope the show will be too!